The longest-running international architecture exhibition of its kind, the São Paulo Architecture Biennale fought for attention and visitors this year with other younger, concurrent biennales events in Rotterdam, Buenos Aires or Shenzhen/Hong Kong and as well as festivals in Sydney or Barcelona. In case you considered – as one may – hopping on a plane to check out at least one of these events, d Don’t worry if you didn’t make it to Brazil: the latest edition of the Bienal (Portuguese for Biennale) was nothing short of an embarrassment. Following a 20-year hiatus since its 1973 independence from the Venice-model, 1951-founded São Paulo Art Bienal, by 2003 the event enjoyed ten years of regular biannual editions. Organisers the Bienal Foundation and the São Paulo section of the Brazilian Architects Institute (IAB) had reasons to be proud: an international reputation and increasing appreciation of Brazilian architecture among the media and the public meant the Architecture Bienal was here to stay. This year however it all seemed to have fallen apart. First, the economic crisis slashed budgets and national ‘pavilion’ representations. 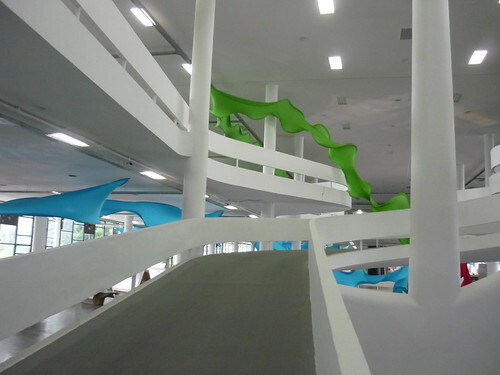 Then the Bienal Foundation withdrew from the organisation, contributing little else than the Niemeyer-designed, landmarked building that has housed both exhibitions since 1957. The IAB, plagued by internal power disputes, was left on its own and just couldn’t handle the job. This year’s appointed curator, Bruno Padovano, was sacked two months before the opening after commenting on a newspaper how previous editions of the event left the exhibition halls empty of visitors – a provocation on how the Bienal was unable thus far to address and attract a larger audience. Padovano wanted a populist event, aimed not just at architects but everyone, even children. By focusing on Brazil’s two future mega-events, the 2014 Football World Cup and the 2016 Rio de Janeiro Olympics, the exhibition would steer away from big-name architects and more cryptic themes to highlight issues such as planning, infrastructure and housing – Brazil’s main architectural concern by any measure. This year’s theme, “Urban Echoes”, meant to approach the impact of these international events on the city and the environment. One visit to the Biennale is enough to understand such broad statements are easier said than shown. The exhibition was loosely divided into four broad subthemes/areas across the building’s three long, ramp-connected halls. On the ground floor, Spatiality was a euphemism for ticket office, sponsor booths and a bookstore. In Connectivity, local institutional and governmental stands showed large-scale state-run projects. On the first floor, Originality was the “international architecture exhibition” part. Panels and models sent by professional and student architects from Brazil and beyond took up most of the hall. Showing designs for such disparate things as airports in Angola, private villas in Brazil and education centres in the Basque country, but also furniture and even a visual identity scheme, these panels were stuff you’d expect from a student show. N – not from a curated, reputable Biennale. Down the hall, ‘country pavilions’ from nations (Netherlands, Germany, Portugal, France), territories (Hong Kong), regions (Emilia Romagna) and consultancies (Aedas) ‘represented’ with varying levels of commitment and content. Student workshops held at the German stand during my Thursday afternoon visit gave a human presence to a hall with too much empty space and hardly any visitors. The top floor, Sustainability, was where the twelve stadiums to be built or renovated for the World Cup were presented – less as significant additions to each of the host cities and more as flashy 3D renderings of “sustainable arenas”. Across the floor, seminar rooms were empty and, I was told, remained so throughout much of the Biennale’s workshop and talk Bienal’s calendar. At the end of the hall, the tire manufacturer Pirelli had a 500 sq. meter stand. That would seem out of place if this whole exhibition were something to be taken seriously. Sadly, it wasn’t. Much like Brazil, the São Paulo architecture biennale has had a pretty bumpy ride. But as the country gets its act together and is now gearing up – through social and political stability, economic prosperity and growing global clout – to be a twenty-first century superpower, shouldn’t its main architecture showcase do the same? The upside to this year’s embarrassment is that local architecture magazine editors, critics and other professionals have stirred a debate on both trade and general media, while taking action inside the IAB to demand a say in the future of the event. And that’s good news: the Bienal can only get better. Go ahead and book your plane ticket for 2011. I visited the São Paulo Architecture Biennale on the 12th and 13th of November, while spending a week there to attend TEDx São Paulo and interview people for my MFA thesis, Alvorada. Before leaving New York, I pitched a review of the Bienal to Kieran Long, then editor-in-chief of Architecture Review. He commissioned me a 750-word piece, which I duly delivered. The following month Long told me he had left the magazine, but that the article would be published in the January 2010 issue of AR. It was indeed, but instead of around 750, it was cut down (and rather well, I might add) to just over 300 words. For the sake of my own archive, I chose to have the whole, submitted piece here and show what bits were edited out.